Matching Dragoons: Jonah Hex #75 "The Bloody Saga of Railroad Bill! 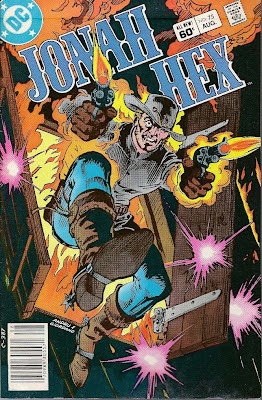 Part 2"
Jonah Hex #75 "The Bloody Saga of Railroad Bill! Part 2"
"The Bloody Saga of Railroad Bill! Part 2"
A quick two page recap of last issue and we find Terry sneaking back into the cabin, but Bill Clinton is standing there as he enters. Terry insists that he has just been out for a stroll but Clinton isn't buying any of it and shoots Terry dead. That awakens the rest of the gang and Clinton's Ma & sister. Before everyone can get calmed down and back into bed, Graphus and one of his men sneak up to the window. Graphus orders his man to toss a bomb through the window but the man hesitates when he spies the women. 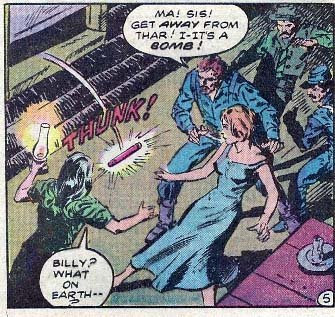 Graphus orders him to throw it anyway and the bomb lands in the room with a thud. Clinton dives for cover but his ma & sister take the brunt of the blast. Clinton starts screaming his vengeance so Graphus can hear. The four remaining men of Clinton's gang and Jonah Hex finally convince Clinton that they need to flee the burning cabin. They bust out the back door, heading for the corral when Hex sees a Pinkerton drawing a bead on Clinton. He kills the Pinkerton, saving Clinton's life and they all grab the horses from the corral (magically saddling them) and they ride off with Graphus unable to give chase due to their horses being worn out. Later on the trail Clinton thanks Hex for the save and explains that when he rode with Quantrill he spent some time in prison and he vowed that he would never go back. They part ways with Clinton explaining that if he ever sees Jonah Hex again, he will kill him. 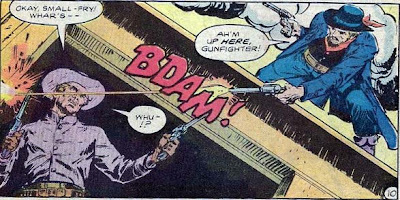 Three weeks later, Clinton and his men have blocked the rails and are robbing a train when they open up the mail car they are greeted by Jonah Hex! Clinton is atop the car and fires at Jonah, missing, and allowing Jonah to slam the doors shut and lock them. In the meantime the crew have cleared the tracks and started the train rolling again. Clinton jumps from the train and they give chase but can't catch up to it. One of the gang accuse Clinton of missing Hex on purpose and gets a pistol to the face for his troubles. 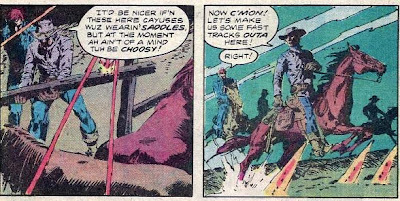 He tells his gang to head to one of their hideouts while he goes and kills Jonah Hex. Four nights later, Jonah is sipping coffee by a campfire, contemplating his next step since he has been unable to track down any sign of Clinton or his men. Unknown to Jonah, Clinton, in the rocks above him, has his rifle sights on Hex. Just before Clinton can fire, Graphus steps out of the shadows. Graphus says that he has captured all of Clinton's men but none of them will talk. Now Jonah Hex is going to tell Graphus how to find Clinton. Clinton is now in a quandary. He can't shoot both Graphus & Hex before they return fire so he has to make a choice. Graphus or Hex? Clinton's bullet slams into Graphus and Jonah dives for cover. Jonah can't return fire so he starts making his way around to the back of the hill. Above, Clinton continues to fire, trying to nail Hex, but he soon runs out of shells and decides to hightail it before Jonah can track him. 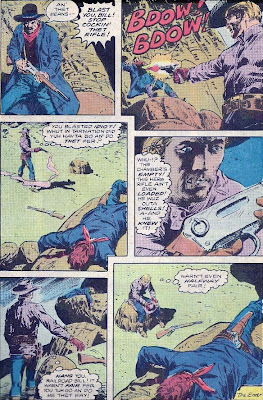 Just as Clinton is coming down from the rocks, he turns to find Jonah Hex holding a pistol on him. Jonah tells him to drop the pistol and Hex will take him in. Clinton once again swears that he won't go to prison and starts to raise the empty rifle. Jonah warns him again but Clinton starts to draw a bead on Hex so Jonah shoots Clinton twice, killing him. As Jonah examines the rifle he finds that it was empty. Timeline - This had two time spans, three weeks & 4 nights (25 days). Add that to last issue's 8 days and the Saga of Railroad Bill covers 33 days. No sign of continuity from issue 72, but we'll get back to that soon enough. A fairly good issue with Jonah not doing a whole lot, again the majority of the story was Bill Clinton, but the conflict at the end was handled well. The best thing about the whole book was the cover, one of the best in the whole entire run of WWT & Jonah Hex. I love the tilted title, Jonah's coat on fire, the angle and perspective are just perfect. It has to be one of the top 10 covers of the series. Hey, that IS a nice cover! Too bad about Clinton, for a train robber, he was a nice enough fellow. I still think that evil Pinkertons are cool.